1) Source: First discover the source of the roaches. For this you will have to do a check in the night, as roaches are nocturnal bugs. Do a thorough check in the dark areas of your kitchen, moist areas of bathroom, cracks in your cabinet and corners of your cupboards. Determine from where they are creeping in to your house. Mostly these insects enter from vents and drains. Once you get the source then you can put the medicine or pesticide and check the next day. - Home remedy: Let me give you a very simple home recipe to kill them. You need to make dough with equal parts of boric acid, sugar and flour. Make balls from it and keep them behind your drawers, in the cabinets, below the gas hob, near the drain, below the sink and every corner where you feel they could hide. The trick is that sugar attracts these bugs, flour sticks them and the boric acid kills them. It is a very simple technique and it works really well. -Insecticide spray: Invest in a pest spray and get rid of roaches in the simplest way. You will only need to spray on them to see them struggle and die. Please keep them away from reach of children and follow the safety instructions. 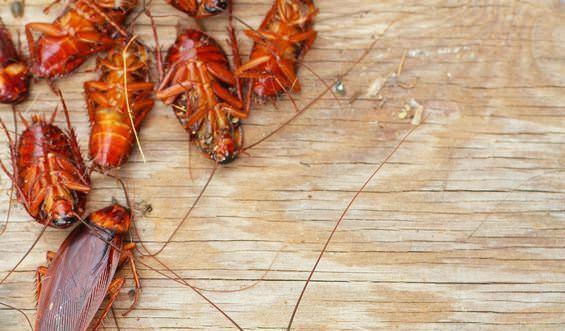 -Roach traps: You get such traps especially to handle roaches. They have an adhesive that kills the bug. Using bait, you can lure them into the trap. You must keep such traps along the roaches paths in your house. • Cockroach bait: Roach bait comes in the form of a gel that has lethal poison and attractive food to lure the roaches. They eat the bait and carry it to their nest. This kills all of the roaches. This bait comes in a childproof case. • Liquid concentrate: You get such concentrates from the market. Make sure to dilute theme in water before you could mop them on surfaces to get freedom from roaches. -Pesticides: You can source professional pesticides from the Internet and spray around the boundary of your home. These are very effective and if you are really suffering from roaches, you must look into this option. 3) Avoid re-infestation: Maintain cleanliness in your kitchen and do not leave any kind of food around to attract roaches. Naphthalene balls are also effective in keeping roaches away. Seal all the possible cracks in your house so that bugs do not survive there. 4) Take professional help: In case none of the methods help you to get rid of roaches then you must hire a professional team to help you deal with this problem.